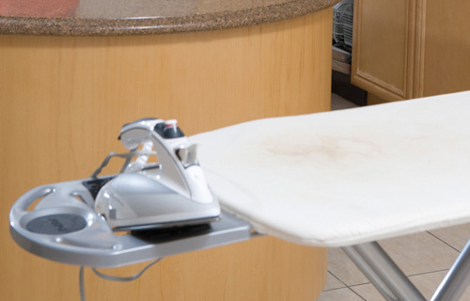 Unplug idle appliances – such as irons, coffee makers, blenders, curling irons and other appliances that may get hot when in use and could scald a child if they should pull them down or touch them. Place the appliance out of reach of children while in use and after it is unplugged as the appliance may retain heat after use. Secure electrical wires – Use wire ties to secure lamp cords to the side of tables and gather up the remaining wire in a cord shortener. Gather up cords that are running along a wall with a cord cover to keep them together and off limits to a curious toddler. 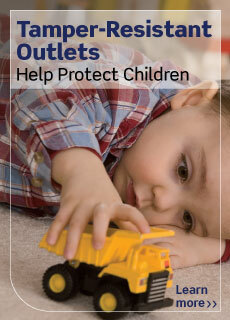 Cover and protect outlets – At one point or another, a curious toddler will most likely try to put something into an outlet which can lead to serious electrical shock. Covering the outlet is good, but it’s better to prevent shock from inside the outlet itself. 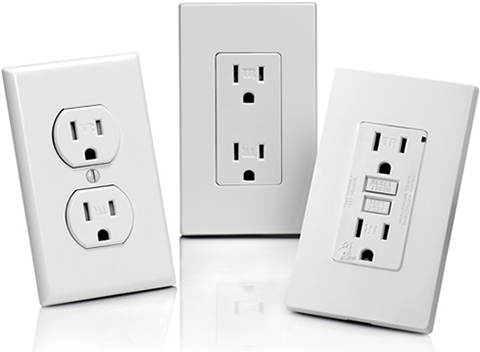 Install Leviton tamper-resistant outlets which have a shutter mechanism inside that blocks access to the contacts unless a two-prong plug is inserted. For power cord strips, purchase a cord strip cover which completely blocks access to the power strip but will allow cords to remain plugged in. Teach kids that water and electricity don’t mix – Whether they’re coming out of the shower or bathtub or coming inside from the pool, be sure kids are completely dried off before touching an outlet, light switch, hair dryer or any other electrical appliance. Be mindful of hazards during lightning storms - If possible, unplug electronic equipment before the storm arrives and avoid contact with electrical equipment and cords during storms. Lightning can also come through pipes so avoid contact with water and plumbing, including sinks, baths and faucets.